Kellen is almost sixteen years old and rapidly approaching his magical trials. Will he become a mage of Jan’Tep, like his powerful father Ke’heops? Or will he instead be declared an unmagical ‘Sha’Tep weakling’, destined only to serve a mage? The pressure is on. His younger sister, Shalla, has already sparked magical bands in multiple disciplines, but Kellen has none. Desperate to avoid the shame of being declared Sha’Tep, Kellen passes his first trial by tricking his opponent into believing he is performing a spell against him. (‘Magic is a con game.’) Shalla pronounces him a cheat and then casts her own spell against him, hoping he’ll find some magic within to shield it. He doesn’t – and she nearly kills him. Fortunately, a mysterious stranger (Ferius Parfax) saves his life. Ferius, whom the townspeople suspect to be a Daroman spy, empathises with Kellen and continues to look out for him. When Kellen discovers the shameful truth about the Jan’Tep people, and becomes a victim of their cruelty, he turns to Ferius – and a smart-mouthed squirrel cat, Reichis – to help him escape and find his own destiny instead. But who exactly is Ferius, and why is she so keen to help Kellen? 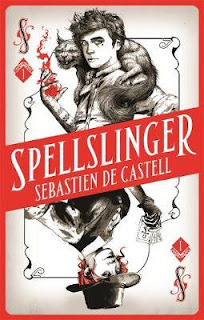 Spellslinger is the first YA fantasy novel in a new set of six books by Sebastien De Castell, author of the Greatcoats series. He describes the book as being set in the same universe as his Greatcoats series, but on a different continent – one ‘more akin to the American frontier’. 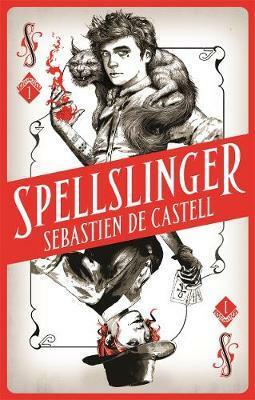 The dark, western feel makes it quite a unique, magical story! The novel is fast-paced, told in first-person perspective, and broken up into four parts representing Kellen’s magical trials. Essentially, it’s the story of a teenager trying to find himself. It’s about how he stands up to those who shame him, and finds his own direction in life. Kellen stops striving to become a Jan’Tep after he learns that ‘there’s no amount of magic in the world that’s worth the price of a man’s conscience’. With the support of Ferius and Reichis, he is ready to assume his place as the ‘Spellslinger’; a role that Ferius predicts ‘might just change the world’. Kellen leaves behind a trail of allies and enemies that will no doubt make the forthcoming books rather action-packed!